FACT: The JUUL appears more harmless to teens, however, a JUUL is a vape pen. Stanford students designed it because they wanted to create a better device to be used to quit smoking traditional cigarettes. In fact, according to Nielsen, JUUL has captured more than half of the market. Myth #2: JUULs are only accessible to those that are 21+ years of age. FACT: While legally, vape pens (including the JUUL) are only sellable to people over the age of 21, it is incredibly easy for teens to acquire them from convenience stores, older friends, or order them online with a prepaid debit card. Because the JUUL is a small, metallic device that resembles a flash drive, once purchased, they are easy to conceal. Myth #3: JUULs don’t have nicotine. FACT: A new study found that 63% of teenage JUUL users don’t know that the device contains nicotine. A JUUL is composed of two pieces: the stem and the pod. The JUULpod is the flavour cartridge, which contains as much nicotine as a pack of cigarettes. In fact, this concentration of nicotine is higher than in other vape pens or ecigarettes. The liquid was specifically designed to more closely mimic the experience of smoking traditional cigarettes. This makes it more addictive to unsuspecting teens. Myth #4: You can’t get addicted to JUULs. 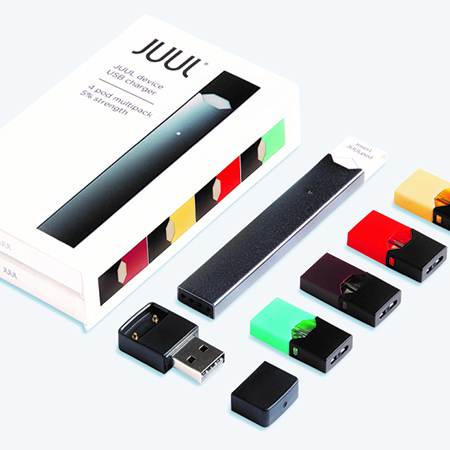 FACT: The nicotine content in JUULs make them more addictive than other vape pens, especially for teens and young adults that are unaware of their nicotine consumption when JUULing. Additionally, research has shown that teens that use vaping devices are four times more likely to go on to smoke traditional cigarettes. FACT: Unfortunately, there isn’t enough research on the effects of vaporizing and inhaling chemicals along the same lines as the effects of smoking traditional cigarettes. What research has shown, however, is that nicotine has a negative impact on growing brains. It has been suggested that nicotine can cause depression and mood disorders in long term users that started ﻿as teens.